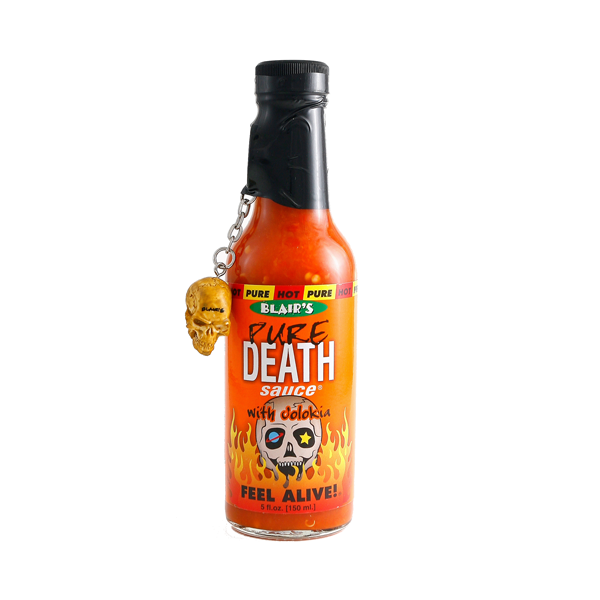 I was given a new hot sauce as a gift, Blair’s Pure Death Hot Sauce with Jolokia (Ghost Pepper) and Skull Key Chain , with the new pepper hotter than a habanero, called Naga Jolokia. I’ve been enjoying this hot sauce quite a lot, especially on Mexican food and in soups. It was so good that I ended up going through the whole bottle within a couple of weeks. The flavor, while not strong, is still unique and the heat level is quite nice. Overall, it’s a keeper. What’s especially nice about this hot sauce, and indeed all Blair’s hot sauces, is the fact that they use all-natural and high-quality ingredients, which you can see below for this particular hot sauce mentioned in this post.